This panel discussion was between four distinct people who are all loyal to the state of Karnataka. Vikram Sampath, one of the founders of Bangalore Literature Festival, is currently the director of Symbiosis School of Media and Communication. He also writes narrative non-fiction and has published books that deal with historical themes. Dinesh Gundu Rao is a Congress politician who is Minister of State for Food, Civil Supplies and Consumer Affairs in the Government of Karnataka. He was president of the Karnataka Youth Congress previously. Tejasvi Surya is an advocate at the High Court of Karnataka, the State Secretary for BJP Youth Wing in Karnataka, co-founder of Centre for Entrepreneurial Excellence, and founder of Jagrut Bharat. Prof. Krishna Murthy Hanuru teaches Kannada Folklore at Kannada Study Centre, University of Mysore. He has been an avid collector and interpreter of Kannada folklore for decades. 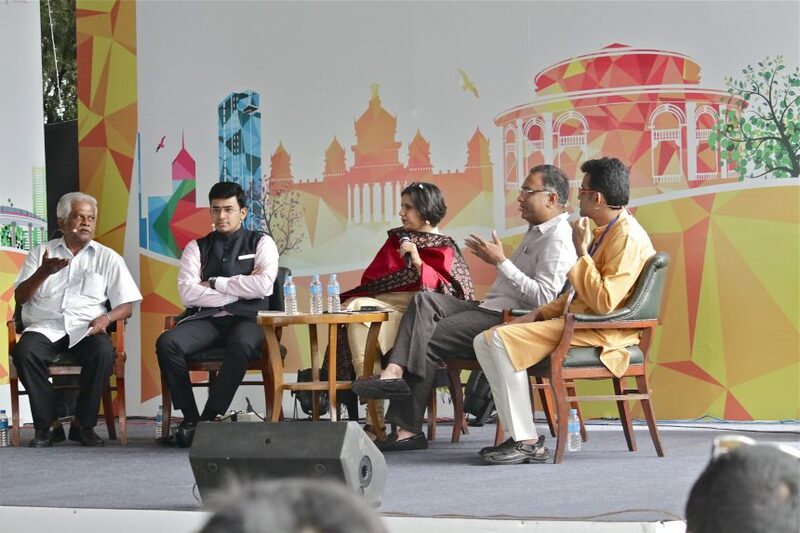 With NDTV anchor Maya Mirchandani as the moderator, the panel discussion began with with Vikram Sampath explaining the history of Tipu Sultan and his contribution to the state of Karnataka. They were discussing and trying to discover who Tipu Sultan is and why we are facing a controversy over someone who ruled a princely state 300 years ago. It was argued that the difference between historic facts and the interpretation that follows leads to the controversy. The other topics which were discussed was the fact that India was not divided into states 300 years ago, and it’s not advisable to let the historians debate on the facts and research. Prof. Hanuru stated that rulers earlier used to use different tactics to win wars. He also said that Tipu Sultan was portrayed to be larger than life and may not be as courageous as everyone thought he was. Dinesh Gundu Rao stated that Tipu Sultan was a heroic person who took on the British and his Jayanti (Birhday) is celebrated in Karnataka for many years as he is considered Karnataka’s hero. He also said that if Tipu Sultan was not a Muslim, this discussion would not have taken place. Tejasvi Surya held the strong view that Tipu Sultan was a Muslim fanatic who forcefully converted a lot of people to Islam. Vikram Sampath questioned the worth of discussing whether Tipu Sultan is a hero or a tyrant. He states that he doesn’t mind if a few people or political parties go ahead and celebrate the birthday of Tipu Sultan, but does mind if the State Government celebrates his birthday with the money of its taxpayers while it has other grave issues to solve first. Towards the end of the panel discussion, the moderator let the audience ask a few questions which were answered appropriately by the panel. The session ended with all the four panelists saying that we should not whitewash the atrocities of Tipu Sultan as everyone has a shade of grey in them. Maybe whatever he did was in the name of expanding his empire, but in any case, the Government should stay out of this matter and let the people and communities decide.